The World Trade Center's newest, $2.5 billion skyscraper reached its full 80 stories Thursday — one of three high-rises now up at the site, with one more to go. 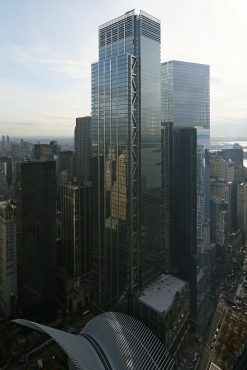 Larry Silverstein’s World Trade Center properties are quickly becoming a hub for the financial technology sector. Hudson River Trading, the fintech pioneer quantitative trading firm, has signed a 69,000 sf lease for the 57th and 58th floors (including the 5,000 sf terrace) at 4 World Trade Center. The real estate industry has surely benefited when buildings are in close proximity to a blossoming park. Luxury residences are popping up in neighborhoods that no longer close daily with the Dow. ...this is the first time in a half a century that New York City has built a truly sumptuous interior space for the benefit of the public. Silverstein Properties partnered with Riviera Caterers for an event space 860 feet in the sky on the building’s 68th floor, featuring otherworldly views of Gotham. FiDi has, or soon will have, almost everything to please its office workers and residents: luxury fashion stores, gourmet food markets and major-league restaurants.